It didn't take long for the Reuters image that Warner Todd Huston wrote about yesterday to show up in another MSM newspaper. 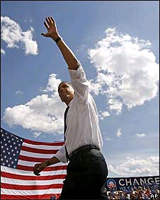 The Obamamessiah image of his photo superimposed on top of an out of focus campaign logo just made its next stop in the UK where it is featured prominently in the Times Online. The slightly cropped version is identical to the Reuters one that Todd wrote about except that this one isn't credited. It is one of many that are making the rounds as the press tries to enhance Obama's image through pictures. The Sydney Morning Herald is celebrating "V-O day" (victory for Obama) in their countdown to June 5th where Clinton will be forced to make a call, again. 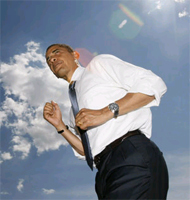 This article is accompanied by a pose of Obama in a fighter's stance, with the cameraman shooting from the ground to make Barack Obama seem line a towering giant. On Wednesday, more than that number of superdelegates will declare their hand and, by Thursday, Obama will be able to claim outright victory for the Democratic nomination for president of the United States. Once it is claimed, it will be impossible, because the numbers are the numbers, for Senator Hillary Clinton to dispute the result, no matter how hard and long she argues about the popular vote, her victories in big states, the key voting blocs she has been winning and her undoubted belief that she is the stronger candidate against Republican Senator John McCain. So Clinton will face a huge choice on V-O Day: to resign herself to it, to align herself with his campaign, or to deny the reality that has been thrust on her. Yes, she can decide not to concede, to keep her legions intact, to keep making her case and to pledge to go to the convention for her name to be placed in nomination against Obama's. She can certainly do this but the only difference it will make is in weakening the candidate who has won and adding newly embittered Obama supporters to her angry loyalists. It is what Ted Kennedy did to Jimmy Carter in 1980 and it had serious consequences for that November's election. The AP used the same sort of photographers trick in a photo that appeared in the BBC. This time the towering Obama is framed by an America flag and a change banner. I suppose if he refuses to wear the lapel pin the press can find other ways to inject patriotism. It is clear that the press will do about anything to get their preferred candidate into office. But don't expect it to stop here. They MSM is on a roll as they hold their collective breath waiting for Hillary Clinton to bow out as V-O day nears. These glamor shots, and many more like them, are just one tool in the media's chest of tricks they use to fill the void that was once referred to as journalism. Terry Trippany is the editor of Webloggin.